Iraq veteran and current Tarleton State University student, Adrian Blunt, said he’s concerned about how veterans are supported after their service. 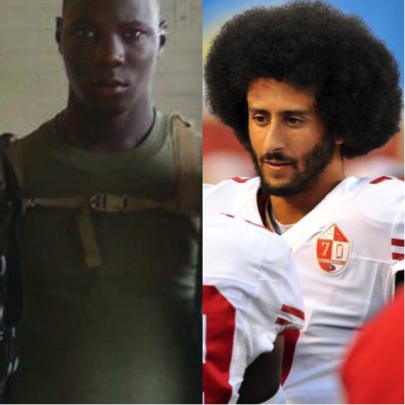 The veteran weighed in on the controversy of 49ers’s quarterback, Colin Kaepernick’s refusal to stand during the national anthem, saying he’d sit with Kaepernick to support the issues behind police brutality. Blunt, 26, a sophomore at Tarleton, served in the United States Marine Corps from 2009 to 2015 working in field radio operations. A graduate of Temple High School, Blunt had plans to play football for Baylor University, but ended up joining the military a week after his twin sister did. Blunt describes military life as being much different from what he was expecting. “I expected it to be how you see it in movies, you know stuff going off everywhere… bombs here, bombs there, explosions, gun fights. [It] wasn’t nothing like that though. It was completely different… completely different.” Blunt described his experiences with combat as scary and tough. “It’s not training. Like, they’re forreal like tryna take your life. In the movies, everybody just seems like ‘yo gung ho lets go, lets get it, I dont care.’ But I mean, you do care and you don’t wanna die. You don’t want the person, your brother next to you to die. You want everybody to make it out and it’s just not like that. Some people they do fall. Some people go down and you just gotta keep moving. It’s tough, it’s really tough,” Blunt said. Even though Blunt has served his country for six years, when the topic of Kaepernick’s refusal to stand during the national anthem was brought up, Blunt said he didn’t feel disrespected by Kaepernick’s protest but actually said he supported him. Next Article » Opinion: Colin Kaepernick, political protest or cry for attention?